Home Medical Care How Much Money Do U.S. Doctors Make Per Year? The results of the 2016 Medscape Physician Compensation Report reveal how much money U.S. doctors actually make. Physicians were asked to provide their annual compensation for patient care including salary, bonus, and profit sharing if employed, earnings after taxes, and deductible business expenses (but before income tax) if in private practice, for the 2016 Medscape Physician Compensation Report. Here is what they found. Orthopedic surgeons are the top earners in the 2016 survey, coming in at $443,000 up from $421,000 in last year’s survey—I guess all that unnecessary back surgery really pays off. (Just kidding! Or not!). Cardiologists came in 2nd place earning $410,000 per year (up from $376,000 last year). Plastic surgeons come in 8th from the top (down from 5th place last year) at $355,000—essentially unchanged from 2015. This is pretty interesting, considering a large percentage of cosmetic surgery is paid for out-of-pocket. Could it be that people are opting for fillers instead of facelifts? At the low end of the totem pole are the primary care docs, you know the ones we need a whole lot more of. Pediatricians’ average compensation is $204,000 (up from $189,000 last year), family physicians $207,000 (up from 195,000), and internists $222,000 compared with $196,000 last year. The specialists who take care of some of the most numerous and complex patients in the country, the diabetes doctors and endocrinologists, are also down at the bottom at $206,000 (up from $196,000). When comparing 2016 to the prior year, it appears most docs got a raise, but two specialties—allergy and pulmonology—experienced a significant decline and two specialties’—plastic surgery and pathology—incomes were flat. Although all of the categories of primary care (pediatricians, family docs, internists) earn more this year compared to last—internists by 12%—it didn’t help move them off of the bottom part of the income list. The highest earnings were in the North Central and South East regions of the United States with mean incomes of $296,000 and $287,000, respectively. At $348,000, physicians incomes were highest in North Dakota due to demand driven by North Dakota’s oil boom. New Mexico was the lowest-earning state at a measly $272,000. A little over two-thirds of physicians are employed as opposed to being in private practice. This is despite the fact that employed physicians ($207,000 primary care, $274,000 specialists) make less (in terms of cash compensation) than self-employed docs ($229,000 primary care, $348,000 specialists). Noteworthy is that employed PCPs had the highest increase in earnings at 10% compared with self-employed PCPs (8%) and all specialists (6%). Women continue to earn less than men (as they have in all of the Medscape Physician Compensation surveys to date), although the difference has shrunk because women’s earnings increased more than men between 2012 and 2016. One of the most interesting parts of the survey are the questions that reflect physicians’ satisfaction with their lot in life. In an answer to a question about fair compensation, ?60% of dermatologists, emergency physicians, and pathologists said they were fairly compensated. Despite their stratospheric compensation ($443,000 per year! ), only 44% of orthopedists said they were fairly compensated…what??? How much do they think they should make? And, speaking of high earners, what about the plastic surgeons—only 47% of them say they feel fairly compensated. Helping aging boomers appear young and beautiful is certainly important (and becoming even more so as gravity and the sun continue to take its toll), but surely they can scrape by on $355,000 per year. It is fascinating that more than half of one of the lowest paid specialties, the pediatricians, feel fairly compensated. But perhaps it isn’t so surprising when we remember that these are the doctors that have sock puppets in their pockets and toys in their waiting rooms. Playing with kids is priceless, no? Sixty-six percent of dermatologists were satisfied with their income, 53% would choose medicine again, and 74% would choose their specialty again. Nephrologists were the most unsatisfied with a 47% overall satisfaction rating (44% happy with income, 62% would choose medicine again, and 35% would choose their specialty again). The survey confirms that short office visits are the norm for primary care. More than half of physicians report spending 16 minutes or less seeing patients, and only 11% of male and 15% of female doctors report spending 25 minutes or more. Over half of physicians (54% of self-employed and 59% of employed) spend 10 or more hours per week doing paperwork and administration. Nine percent of self-employed and 12% of employed doctors say they spend an astonishing 25 or more hours doing so. That time has to come from somewhere—it is eating into time with patients and eroding time with family and friends. Is it any wonder that physician burnout is now considered a major problem for the profession. When it comes to income, physicians, even the lowest paid primary care docs, are doing pretty well compared to the rest of Americans—the average income in 2014 was $44,600. On the other hand, even the highest paid of the specialists aren’t making anywhere near what the super rich are making. According to CNN Money, Dara Khosrowshahi, the CEO of Expedia, was the highest paid CEO in 2015 with an income of $94.6 million. His cash compensation was a mere $3.8 million with stock while his options worth $90.8 million made up the rest. I guess he must have done a spectacular job helping us with our travel because his 2015 income was 881% higher than in 2014. On the other hand, the survey results make it clear that money alone does not bring happiness…or satisfaction. Only 11% of physicians said that “making good money at a job I like” was the most rewarding aspect of the job. In this survey, gratitude and relationships with patients as wells as being good at the job, finding answers, and making diagnoses were what drove satisfaction. Factors like masses of paperwork, the dreaded EHR, reduced face-to-face time with patients, long hours, night call, loss of autonomy, lack of the previous exalted place in society, and other annoyances of day-to-day practice may all serve to dilute satisfaction of practitioners of a profession that was once one of the most highly sought after in the US. Should we be worried? Probably. But I am an optimist and am hopeful that changes in medical education, practice models, and reimbursement may help with physician satisfaction as may digital health technologies and do-it-yourself health care. Of course, it remains to be seen. UPDATE: This article was republished to represent the latest results from the 2016 Medscape Physician Compensation Report. For somebody who is supposed to be so educated, I am really disappointed that you had to use the incredibly ignorant term “totem pole” in this article. Not to mention that you used it incorrectly since the “bottom of the totem pole” is actually a place of honor and respect. I suggest you reconsider using racist terms in the future. This is a great post. Very insightful. 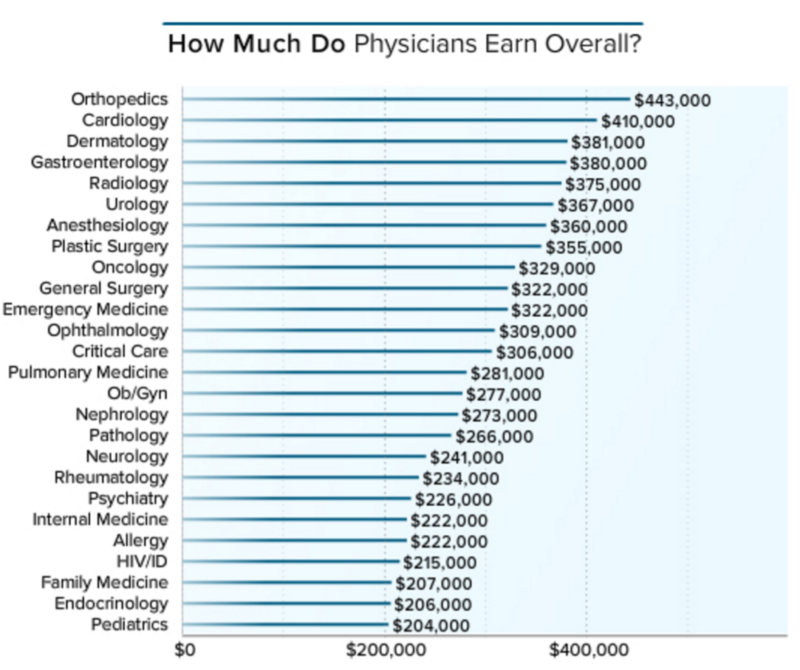 Physicians are certainly well paid, however, we do have to accept that they have a tough job. They are in the business of saving lives, you cant afford to go wrong there! Totally agree. Unfortunately, that is not the only thing wrong with the way US doctors are paid. Much to do to get this right. Where are you from and how are your doctors paid? @Docweighsin @Medscape compensation in context: quality of practice life. Negotiate the employment contract. It’s your practice. Do these surveys include total compensation for doctors? Or only their salaries? Some doctors have low salaries but pay themselves large bonuses at year end. Does any one know if the survey included bonuses? @Docweighsin 25% of PCPs would choose the specialty again. We don’t need to provide incentives, but remove disincentives for primary care. @Docweighsin @NPazderski @Medscape But you’ll still hear some of them whining about how they’re broke because of Obamacare.